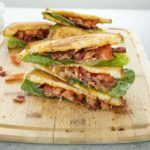 Cheesy Garlic Bread BLT is a classic sandwich amped up with flavor! 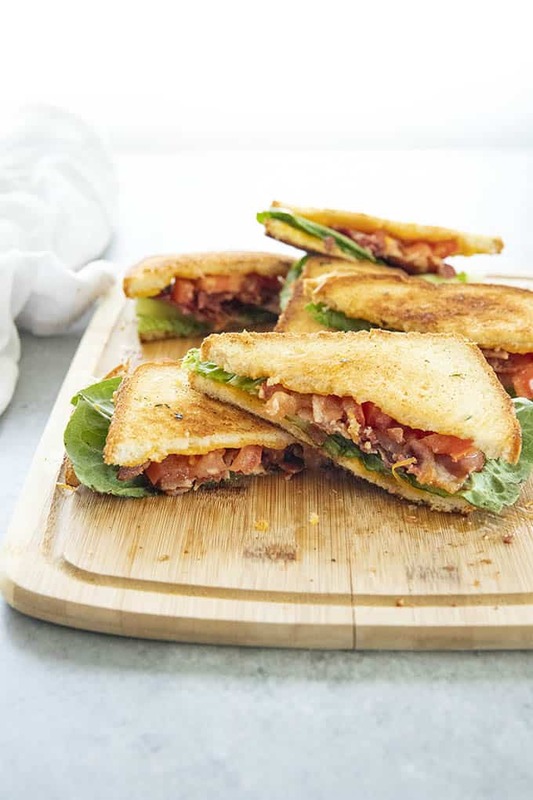 You’ll love the cheesy garlic sourdough bread that makes these BLT’S extra mouthwatering! This sandwich is going to carry me all the way through summer! As soon as the weather even hints at getting warmer I instantly crave a BLT. Love bread, love sandwiches, the end. I also really like taking a classic and making it a little “extra” in any way possible. Other sandwiches I’m crushing on right now are my Hot Ham and Cheese and definitely The Perfect Reuben Sandwich. What Do You Put On A BLT? A typical BLT is pretty standard. You typically have white bread, mayo, bacon, lettuce, and tomato. For this version I’ve used sourdough bread that has been slathered in garlic butter, shredded sharp cheddar added, then toasted to perfection. After that, I like to use Romaine lettuce for better flavor but you can use any lettuce you prefer. Because the bread has tons of cheesy garlic flavor, I stuck with standard mayo, and you can always use a spicy of flavored mayonnaise too! This recipe makes two sandwiches as written. Feel free to double or triple the recipe as needed. First things first, get your griddle or a large non-stick skillet preheating. 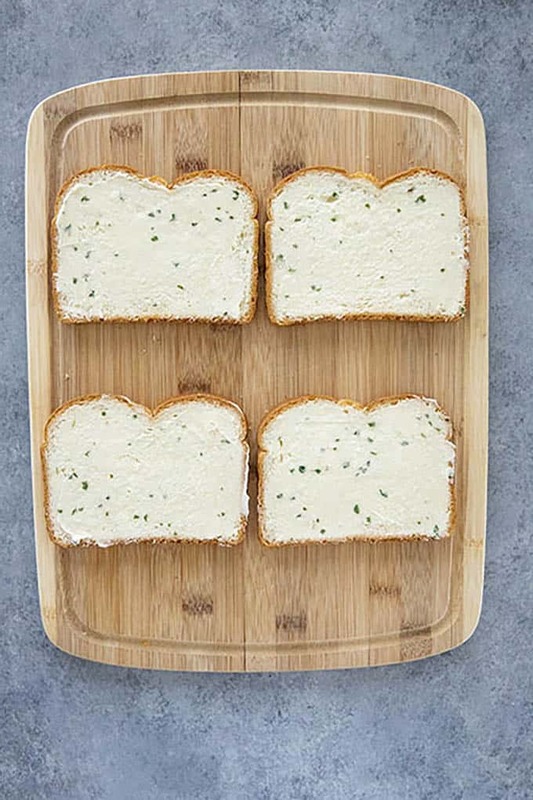 As you can see in the first photo here, I lay my bread out on a cutting board and then spread the garlic butter mixture on one side of each slice of bread. Once the bread is buttered evenly, flip the slices over and top evenly with the shredded cheese. Note that I like to use shredded because it melts faster, but you can use sliced if you prefer. Also feel free to mix up your cheese choice! I can happily report that this is great with pepper jack, monterrey jack, and even mozzarella! Next, lay your bread slices carefully onto your hot griddle or pan, butter side down. You’ll have your pan over medium heat, and it won’t take more than 3-4 minutes to toast the bread and melt the cheese. 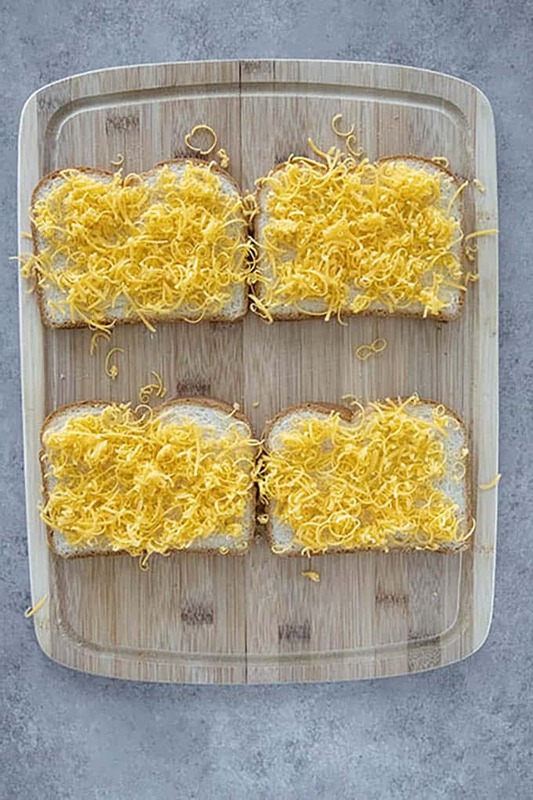 Once the cheese is melted, place the slices of bread back on the cutting board so that you can add all of your toppings! I like to layer on mayo first, right over the melted cheese. Then, add your bacon, tomato, and lettuce in any order desired. I used Roma tomatoes for my sandwiches and three slices of bacon per sandwich. Feel free to use any type of tomato you like best. If you are a huge bacon lover, you can always stack more on! I also don’t add an actual measurement for mayo in the recipe card, because that’s always personal choice. Cheesy Garlic Bread BLT is a classic sandwich amped up with flavor! 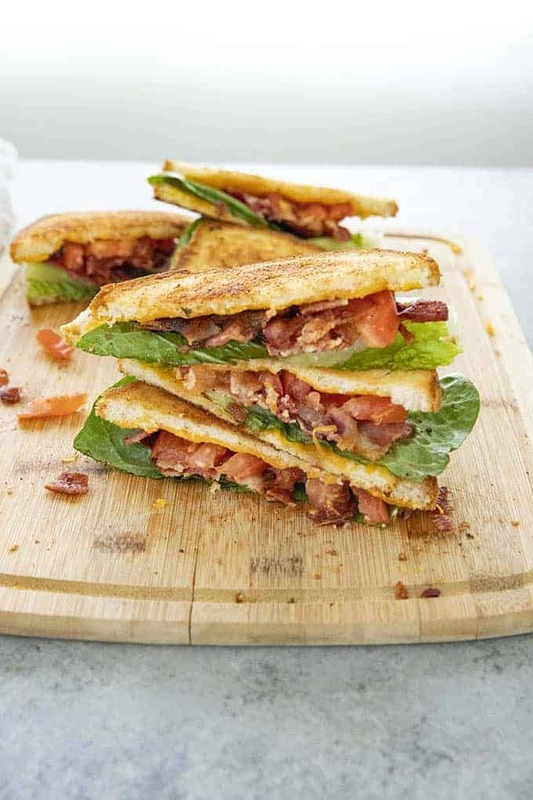 You'll love the cheesy garlic sourdough bread that makes these BLT'S extra mouthwatering! Preheat a griddle pan or large skillet over medium heat. In a small bowl use a fork to mix together the softened butter, garlic powder, salt, and dried parsley flakes. Lay the bread slices down on a cutting board and spread the butter mixture over one side of each slice of bread. Flip the bread over and top evenly with the shredded cheese. Place the bread slices butter side down on preheated pan and cook for 3-5 minutes until toasted and cheese is melted. Remove the bread slices with a spatula back to your cutting board butter side down. Top with mayonnaise, bacon, lettuce, and tomato as desired. NOTE: I did include a total of 20 minutes cook time to include the time the bacon would take to cook. NOTE: Feel free to switch up cheeses to use your favorite! You can also use as much extra bacon and mayonnaise as you prefer. NOTE: This recipe is easily doubled or tripled for a crowd. I love sandwiches and I love the add of garlic to the bread, thank you for sharing. 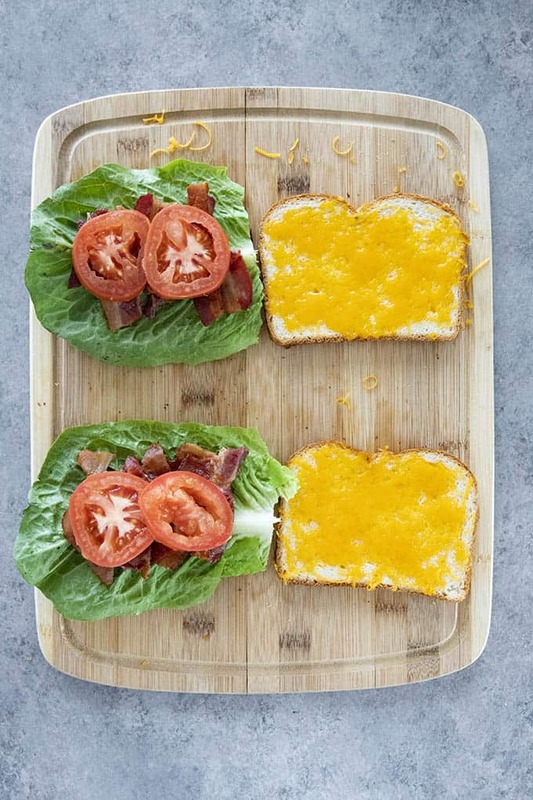 I love the idea of making a BLT on garlic bread — genius! This is one seriously delicious sandwich, and I love how easy it is. Oh my gosh, this looks like THE ultimate sandwich. Cheesy garlic bread… now you’ve captured my heart! A classic BLT is one of my all-time favorite sandwiches, but this cheesy garlic bread twist steps it up a big notch. I would love to try this! Perfect sandwich to pair with a cup of tomato soup! well i just fell in love all over again. this look like the most amazing salad. I definitely have to try this out – can’t wait! I love BLTs but normally just make them pretty traditional. Such a great idea to add the garlic butter and grilled cheese! Yum! I love sandwiches and I love grilled cheeses, and this is a perfect match! This is exactly what I’d want for lunch today. Fresh with the salad and salty with the bacon and cheese, sounds great! Yum! 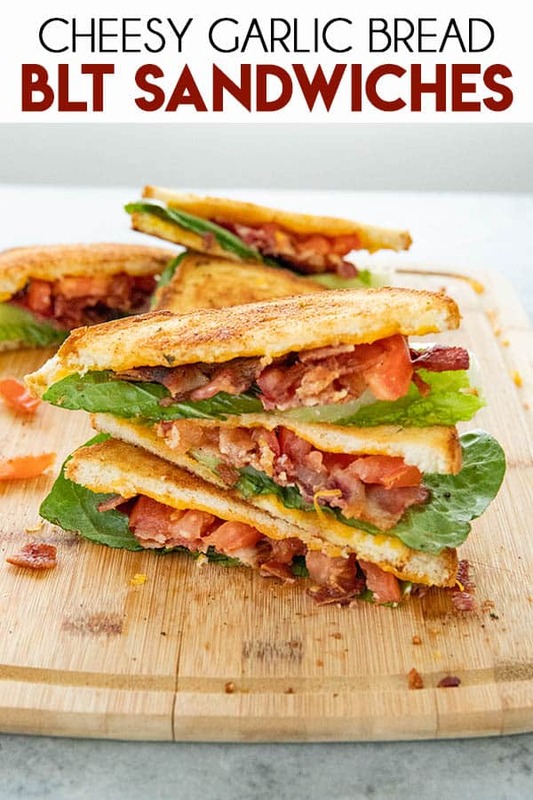 I also love a BLT in the summer but this cheesy garlic bread blt takes it to a new level. Such a great idea!